A couple of weeks ago I noticed a howling from the power steering pump caused by a lack of power steering fluid. I've since pulled of the under-body plastics and found where the fluid has gone! On first glance it looked like the fluid was pouring out of the back of the rack gator which would signify that the seals in the rack had gone. Closer inspection has revealed that the thin pipes on the rack have corroded through, and the fluid is leaking from one of these pipes. My question is... Can these pipes be replaced with the rack in-situ? Has anyone carried out this task? I'm having considerable difficulty disconnecting the feed pipes from the rack. The corrosion seems to have welded them in place. Does anyone have any tips on getting these free? Hopefully Wasz will be along soon- he knows about steering pipes and has a source for replacement rather than buying the whole rack like Porsche insist. Hi yes I had a local mechanic do these on my car (I had no time). You can buy just the hard pipes for £40 here: https://tinyurl.com/y9vl9q3s or any local hydraulic hose place (pirtek?) could make them up. He had to drop the subframe a bit to gain access. You should change the brake line that runs across there too while you are in there as it will be crusty. In dropping the subframe, he dropped the rack off the end of the steering column. My car is an MY99 and these had a plastic coating on the column splines. Over the years this had degraded and came away from the splines when it was removed.... so also needed replacing. However an MY99 (unlike later cars) have a one piece steering column so the whole lot had to be swapped. I managed to get a good used one for £50 though. Later cars the lower UJ and splined bit is a separate replaceable piece. Just be aware that the same might happen to you if its an early car. Thanks for the info. I bought a second hand rack on eBay this morning (before I had properly diagnosed the leak) that looks to have decent pipes on it. Mine's a MY2002, so shouldn't have the same issue. The big struggle will be getting the pressure lines off if I need to pull the rack out, so I've ordered a slide hammer and gallons of Lusol! Fair enough. Might be easier and cheaper to fit new lines to yours though and return the other rack (remember if you paid by PayPal then PayPal will refund your return delivery). Or you could fit new lines to your old rack and sell it on. I cant believe how cheap those pipes are and free UK delivery. I've just bought a pair based on the fact that I'm going to need them at some point - may as well do it as a preventative measure. My rack pipes look particularly scabby. As I'm having the suspension apart shortly it makes sense to change them. I only live 1/2 hour away from the Power Steering Store in Balsall Common so have arranged to pop over and collect them. I'll be checking out the L to R brake pipe too! Yeah worth swapping them if you are getting a geo done and they are crusty. You don't really want to do it twice or be stranded. Put jubilee clips over the crimp ferrules on the flexible lines while you are there. ..................and they arrived today - can't fault that. Has anyone dropped their front sub-frame? I'm planning on tackling it this weekend. If anyone has a DIY on this, I'd be glad to hear about it. I found a couple of pages on 6speedonline and Rennlist that may come in handy, but if anyone has any hints or tips, I'd love to hear them. Here's a quick update. I've dropped the anti-roll bar and it looks like I will be able to access the flare nuts on the two hard pipes.so with a bit of luck, I should be able the replacement of all of the necessary bits and pieces without dropping the subframe. Mike's is a C4 and the front transfer box is attached to the subframe, so I'm not sure if I'd have to dismantle this as well. Thanks for the update - I’m collecting the new pipes next week and changing all the shocks after the bank holiday. Mines a C2 so hopefully less in the way! Another update and a cry for help! I dropped the sub-frame slightly as access to the pipes was very limited. Long story short... It didn't help! I only managed to create a small bit of space and I couldn't get a spanner onto the hard pipe flare nuts at the end of the rack. I decided the only way forward was to pull the rack out. I managed to get one of the power steering hoses removed from the rack using a slide hammer, but the other is stuck fast and there is no way it's coming out. 2. Does anyone know where I could purchase new hoses if required? I've checked Design 911 but I can't find them on their site. This job has grown arms and legs! 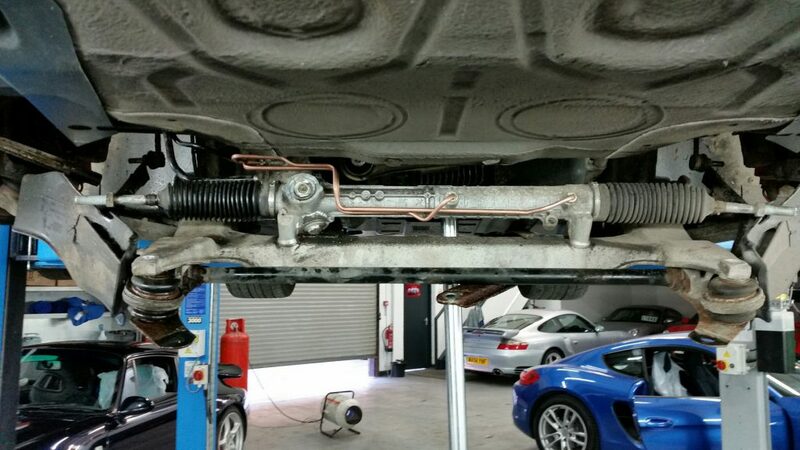 There is a good picture on the RPM website showing the subframe hanging down at the front with steering column disconnected. All the pipes seem exposed / accessible. Cheers Ian. I saw that! Too late now as I've started disconnecting the rack, and the one of the connections has seized part of the way out. I can't get it out or back in. I think I'm going to have to bite the bullet and either get a mobile mechanic out, or get the car towed to a local garage. I don't want to risk damaging the pipe as I can't seem to find one to buy online. All in all, it's a bit of a nightmare, and it was all going so well! Nooo! Can you not get the lines back in? Those are long and very expensive new. You may be able to get a local hydraulic hose engineer (PIRTEK?) to make up new ends for you. AFAIK my mechanic dropped the rack off the column and left the lines connected. Usually the best way to tackle the nuts is to cut the crusty hard line off and used a well fitting socket on the flare nuts. That looks like a C4... It looks like the transfer box is being held up with that chrome pole. I will have another try of getting the lines back in. Tapping them in with a punch may help, and Pirtek is another option. I have a spare rack that I could take over to them to see if they could get something to fit. How is it going? Picked my pipes up in person from the power steering store on Wednesday and will tackle when I do the front suspension refresh. Any update - I’m just tackling mine and its challenging! Got 3 of 4 pipe unions undone with it in situ but the last one is resisting due to access! !